Today April 9th, around 6am, the head of Japan’s largest organized crime group, the Yamaguchi-gumi (山口組), Shinobu Tsukasa-kumicho (司忍組長), will leave Fuchu Prison after serving his time for violations of Japanese Firearms and Swords Laws. He is now 69 years old. He officially became the 6th generation leader of the Yamaguchi-gumi on August 27th, 2005 at a succession ceremony at the Yamaguchi-gumi headquarters in Kobe. He quickly engineered a merger with the Tokyo based crime group, the Kokusui-kai* (国粋会）on September 7th, the same year, expanding the Yamaguchi-gumi into Tokyo and expanding their power base considerably. On November 29th, 2005, Tsukasa-kumicho’s was sentenced to six years of hard labor went for violations of the swords and firearms laws, after a long legal battle. On December 5th, he turned himself into the Osaka Police Department and began serving his time. While he was gone, he trusted the organization to his number two (wakagashira), Kiyoshi Takayama. Takayama was arrested last year on charges of extortion and is expected to be found guilty and serve several years in prison. Tsukasa-kumicho is returning to an organization that has been decimated by a long running police crackdown. On September 30th of 2009, Takaharu Ando, the head of Japan’s National Police Agency, declared war on the Yamaguchi-gumi and more specifically on the faction that Tsukasa-kumicho came from, the Yamaguchi-gumi Kodokai (山口組弘道会). The National Police Agency asserted that the Kodo-kai was challenging police officers, threatening government officials, and was generally uncooperative and belligerent. Tsukasa-kumicho has been housed at the Fuchu Prison since February 6th of 2006, after he was transferred from an Osaka prison where he began his sentence. His return to power marks a great period of transition for the Yamaguchi-gumi. If he picks another Kodo-kai member as his second-in-command, it is very likely to encourage even harsher police crackdowns on the group–and related groups as well. On the plus side, Tsukasa-kumicho is very much of a disciplinarian and is expected to harshly enforce internal regulations, especially the ban on trading in drugs or using them. The Japanese mainstream mass media is currently camped outside Fuchu Prison as well as the yakuza fanzines. In the tight knit yakuza world, the release of Tsukasa-kumicho is like the Return of The King in Middle-Earth. It will be interesting to see how he begins his new reign. He is expected to arrive at the Yamaguchi-gumi headquarters in Kobe before noon today. 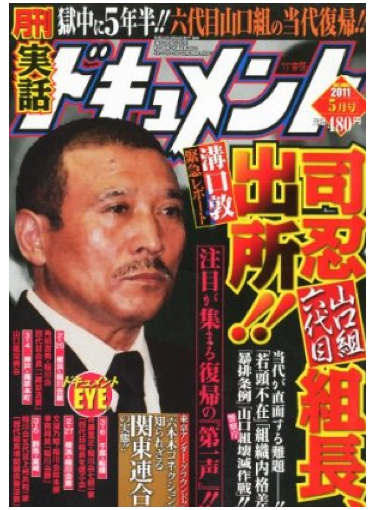 The release of Shinobu Tsukasa-kumicho, the head of the Yamaguchi-gumi, is the biggest news of the year for the yakuza world (and fanzines). 1. Why would you put a plastic bag over your head if you knew you were going to shoot yourself in the head? 2. With number one, above, in mind, I would certainly want to look at the most recent phone calls made and received (and the time for these) on the guy’s mobile phone. The question being, do the calls make any sense for somebody who was about to commit suicide? Your article needs editing. Your English is getting as sloppy as mine. Yes, my English does need editing and/or I need sleep and not to post after having a few drinks with the detectives. In the BBC page, they call him Kenichi Shinoda. Is he the same guy you are writing about? Or maybe they have quite a few names to confuse the rest of us. Kenichi Shinoda is his real name. Shinobu Tsukasa is his yakuza name. What’s more confusing is that in Japan the family names comes first, so it really should be Shinoda Kenichi. I’ll add a note. Thank you. The decision to use the plastic bag is very obvious to me. 1. Having a bag over the head helps keep some of the ensuing debris from messing up the house — it is only polite to try to keep the mess in control instead of leaving it to be cleaned up by the others. 2. Assuming that the plastic bag is made of strong stuff and works, it so keeps your body parts close by instead of splattered all over the room. You want to die and be cremated in one piece. Can I be a yakuza too? Yes, just shred any sense of conscience and decency you have left and replace it with a tribal loyalty and a willingness to die for your Oyabun or spend a decade or so in jail on his behalf. I thought yakuza’s were cool. Have you seen the game? It’s very popular in Japan. Please tell me if real yakuza are like that. They seem valiant. But I don’t know whether they are evil and will harm others without a care. By the way Jake, I just saw your interview! You were talking about this game! That’s awesome! I would like to ask. Are foreigners treated unfairly in Japan? I heard they don’t allow foreigners to go to certain places and are not really welcome. Is that true? Are there any ‘noble’ yakuza around? They are actually criminals right? So they can’t be good people? Congrats on your book release by the way.